As per central government norms, Post Office Recurring Deposit Account is of 5 years. For opening of rd account online, people can make minimum initial deposit of Rs. 10 per month and afterwards any amount in multiples of Rs. 5. There is no maximum limit in 5 Years Post Office Recurring Deposit Account (RD). People can Compare All Post Office Schemes 2018 before making investment. RD Interest Rate is taxable and TDS @10% is deducted on the earned interest. Post Office RD Accounts offers higher Interests than Bank RDs. People can also compare other Post Office Schemes like National Saving Certificate (NSC), Public Provident Fund (PPF), Kisan Vikas Patra (KVP), Sukanya Samriddhi Yojana (SSY), Post Office Savings Account, Senior Citizen Saving Scheme (SCSS), Time Deposit Account (TD), Monthly income Scheme (MIS) – check nsc vs ppf vs kvp vs ssy vs scss vs td vs mis vs rd vs post office savings scheme. RD Account can be opened in any post office pan India. Candidates can also avail benefits of recurring deposit scheme in banks. Central govt. has permitted RD account opening in various Nationalized banks like SBI, HDFC, Canara bank to ensure higher reach and easy accessibility. Candidates can open this account in cash or through cheque. RD Interest Rate 2018 is 6.9% per annum (compounded quarterly) with effect from 1 January 2018. The interest earned can be calculated using Post Office RD Calculator. RD Account offers sovereign guarantee, capital protection and quarterly interest payment which acts as source of income. This investment is secure as well as this investment has attractive interests. In case of Lump Sum Amount, Fixed Deposit (FD) is preferred and in case the person can save a defined amount from income every month, Recurring Deposit (RD) is preferred. Subscribers have the option to withdraw the earned interest or to reinvest it. However TDS @10% is liable to be deducted for both options under 194A of IT Act if the earned interest is more than Rs. 10,000 per annum. Moreover, Income tax on earned interest is calculated as per Income Tax Slab Rates. Candidates can open his account of minimum Rs. 10 per month and can make subsequent deposits in multiples of Rs. 5. There is no maximum amount of deposits. People have to pay this amount monthly and if the amount is not deposited then there is a penalty of Rs. 0.05 on every Rs.5. If there are 4 regular defaults then the account gets discontinued. Individuals can revive this account in the next 2 months but if not revived then candidates cannot make further deposits. Recurring Deposit Account Interest Rate 2018 is similar to the Interest of FD. But in FD, people have to make lump sum payment, while in RD people can invest in installments. Moreover, FD Interest is paid yearly while RD Interest is paid quarterly. People can also make rd login at website of Post Office RD Account Check Online. Subscribers are allowed to multiple accounts as well as joint RD accounts in Post Offices. People can open this type of account in the name of a minor or for themselves. Facility of nomination is available at the time of account opening or even after opening the account. In RD accounts, any subscriber can operate more than 1 accounts in individual capacity or jointly. There is no maximum limit on the monthly deposit made by an individual. All the people who wishes and are able to make monthly investment should invest in this scheme as the initial deposits in fixed deposit account needs to be made as lump sum investment while RD provide the facility to invest in installments. Moreover, people can track their invested amount and make Post Office RD Account Check Online. RD Interest Rate 2018 currently stands at 6.9% per annum quarterly compounded (effective from 1 Jan 2018). On Maturity, any Rs. 10 monthly account will give an outcome of Rs. 717.43%. Even RD Account Time Period can be further extended to 5 years (on yearly basis). Minimum rd account balance is Rs. 10 per month and any further amount in multiples of Rs. 5. There is no maximum limit. 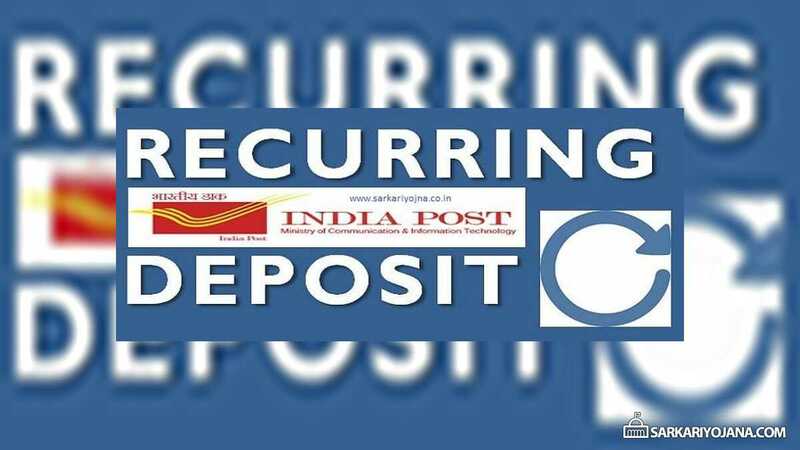 People can open their recurring deposit account in post office through cash or cheque. Nomination facility is available at time of recurring deposit account opening and even after opening of account. Subscribers have an option to transfer their rd account from 1 post office to another. There is no limit on the number of rd accounts which any person can open. RD Account can be opened in the name of a minor. Minors above 10 years of age can even operate their rd accounts in Post Offices. Two adults can open a joint account which they both can operate. For this, both the joint account holders must furnish their details in the Post Office. In case the post office rd account is opened before 15th date of month, then candidates can make deposit upto 15th day of next month. However, if the account opening day is between 16th and last working day of a calender month, then candidates can make subsequent deposit till the last working day of the next month. If candidates are unable to make subsequent deposit till the prescribed dates, then post office will deduct Rs. 0.05 for every Rs. 5. Moreover after 4 defaults, rd account is discontinued and can be revived in 2 months. If not so, then candidates are not allowed to make any further deposits. Post Office offers a facility of conversion of Single Account into Joint Account and vice versa. There is a rebate on advance deposit of at least 6 installments. Minor needs to convert his account in his name after 10 years of age. After 1 year, people can make one time withdrawal of up to 50% of the total balance. Post Office RD Account Check Online facility is available and people can track their rd account online.